How did the character of American politics change between the 1820s and the 1850s as a result of growing popular participation? Between the 1820s and 1850, as more white males won the right to vote and political parties became more organized, the character of American democracy changed. It became more partisan and more raucous, a turn that bred ambivalence and even discontent with politics and the dominant parties. Find more primary resources on popular democracy between the 1820s and 1850s in The Triumph of Nationalism/The House Dividing. Analyze graphics and visual images… as alternative forms of text. The richest document of the three, The County Election is a reasonably reliable depiction of elections of this period. It tells us who participated and who was excluded from election rituals. It illustrates how the parties induced voters to come to the polls and vote for their candidates. They supplied alcohol: note the three stages of inebriation — still conscious in the left corner, about to pass out in the right, and long gone in the center. They engaged in polite persuasion: note the party activist on the stairs tipping his top hat and offering what is probably a pre-printed party ballot to the rural gentleman. But there was also voter-to-voter case-making, unsponsored by the parties but deeply serious nonetheless: note the resolute look and finger-to-the-palm intensity of the solid citizen in the right center. Despite its civic importance and the touch of solemnity imparted by the oath-taking man at the top of the stairs, there is about the whole scene the air of a convivial community gathering, suitable for children and tolerant of stray dogs. While Bingham’s The County Election offers broad commentary on popular elections, Woodville’s Politics in an Oyster House makes a more concentrated point. It depicts the passionate commitments that party politics stirred up, as exemplified by the figure on the right, but also suggests that not everyone shared those passions. It is worth discussing what the attitude of the figure on the left is toward his companion’s political harangue. The older gentleman stares almost directly at us, seeming to implore us to rescue him from his tedious companion. Here, as in The County Election, a newspaper fuels opinions and stirs emotion. The Agrarian Workingmen’s Party cartoon was likely published during the 1830 political campaign in New York (the men listed on the flag ran for office that year as candidates for the Agrarian Party, a splinter group of the city Workingmen’s Party). The cartoon depicts two kinds of politics: one the corruption of republican virtue, the other a restoration of it. On the left, a party politician dressed as a wealthy man — note the top hat again — and carrying a bag of money makes a deal with Satan. He asks Satan to “give me one of your favorites — TAMMANY, SENTINEL, or JOURNAL — or the POOR will get their rights. I’ll pay all.” Tammany was the Tammany Society, one of the most powerful Democratic clubs in New York. The Sentinel and the Journal were the newspapers of rival workingmen’s factions that pummelled the Agrarian Party’s political stands. In other words, the devil controls all the opposing parties; they are all his favorites. By turning one — any one — over to the hack, he will insure that the poor will be oppressed. In contrast, on the right, a workingman, raising a ballot, approaches a box carried by Lady Liberty, who holds a pole adorned with a liberty cap, a symbol of revolution and equality. This lesson is divided into two parts, both accessible below. Three images with accompanying close reading questions provide analytical study. An optional follow-up assignment enhances the lesson. The teacher’s guide includes a background note, the image analysis with responses to the close reading questions, and an optional follow-up assignment. The student’s version, an interactive PDF, contains all of the above except the responses to the close reading questions and the follow-up assignment. From the 1820s through the 1850s American politics became in one sense more democratic, in another more restrictive, and, in general, more partisan and more effectively controlled by national parties. Since the 1790s, politics became more democratic as one state after another ended property qualifications for voting. Politics became more restrictive as one state after another formally excluded African Americans from the suffrage. By 1840, almost all white men could vote in all but three states (Rhode Island, Virginia, and Louisiana), while African Americans were excluded from voting in all but five states and women were disfranchised everywhere. At the same time, political leaders in several states began to revive the two-party conflict that had been the norm during the political struggles between the Federalists and the Jeffersonian Republicans (1793–1815). Parties and party conflict became national with Andrew Jackson’s campaign for the presidency in 1828 and have remained so ever since. Parties nominated candidates for every elective post from fence viewer to president and fought valiantly to get them elected. The number of newspapers exploded; the vast majority of them were mouthpieces for the Democratic Party or the Whig Party (the National Republican Party before 1834). 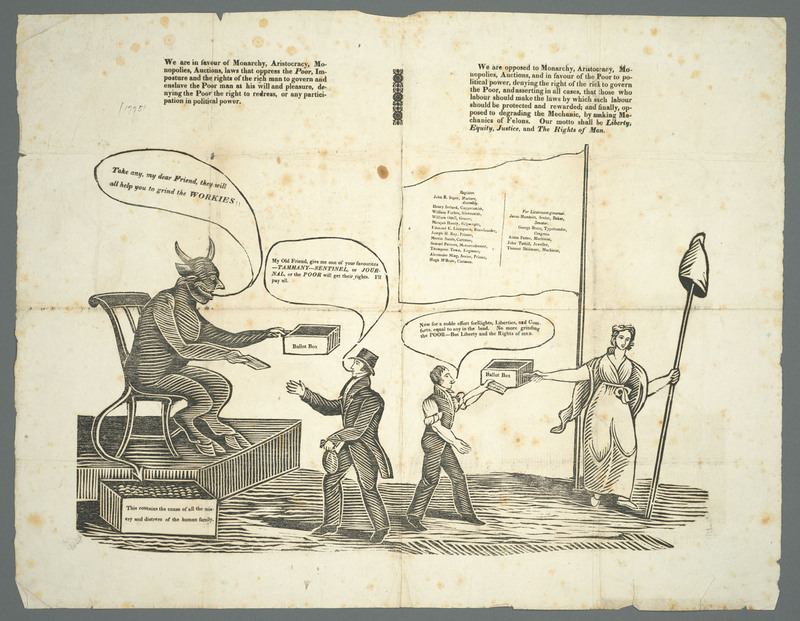 Accompanying the newspapers was a flood of pamphlets, broadsides, and songs aimed at winning the support of ordinary voters and teaching them to think as a Democrat or a Whig. Parties also created gigantic and incredibly effective grass-roots organizations. Each party in almost every school district and urban ward in the country formed an electoral committee, which organized partisan parades, dinners, and picnics; distributed partisan newspapers and pamphlets, and canvassed door-to-door. In this way the parties got ordinary voters involved in politics, resulting in extremely high voter participation rates (80–90%). Even more than in the earlier period, parties were centrally coordinated and controlled. They expected their leaders, their newspapers, and their voters to toe the party line. Once the party caucus or convention had decided on a policy or a candidate, everyone was expected to support that decision. The Democrats, National Republicans, and Whigs were not the only people creating a new kind of democracy, however. Several small, sectional parties promoted a way of conducting politics that was quite different from the practices of the major parties. The Workingmen’s Party, for example, organized in the major northeastern cities and in dozens of small, industrial towns in New England. Workingmen’s parties were part of the emerging labor movement and were made up primarily of skilled craftsmen whose trades were being industrialized. In addition, a growing movement of evangelical Christians sought to reform society by advocating temperance, an end to prostitution, the abolition of slavery, women’s rights, and more. The two paintings and the cartoon offered here capture the passion, tumult, and divisions that came to characterize American democracy at this time. George Caleb Bingham (1811–79) was one of the most successful and important American artists of the early nineteenth century. Born in 1811 to a prosperous farmer, miller, and slaveowner in western Virginia, Bingham knew prosperity but also experienced economic hardship when his father lost his property in 1818 and again when his father died in 1823. While he was a cabinet-maker’s apprentice, Bingham began painting portraits for $20 apiece and, by 1838, was beginning to acquire a reputation as an artist. During the 1840s he moved to St. Louis, the largest city in the West, where he pursued a successful career as a portrait artist. In 1848 he was elected to the Missouri General Assembly and later held several appointive posts. With gentle humor The County Election captures the arguing, the campaigning, and the drinking that accompanied the masculine ritual of voting in mid-nineteenth century rural America. Richard Caton Woodville (1825–55) was born in Baltimore. His family hoped he would become a physician, and he did undertake medical studies in 1842. However, by 1845, when he traveled to Germany to train at the Dusseldorf Academy, he had abandoned medicine to pursue a career as an artist. Although he spent the rest of his life in Germany, France, and England, he devoted himself to re-creating his native Baltimore on canvas. With humor akin to that of Bingham, Politics in an Oyster House depicts a “conversation” between a young political enthusiast and a skeptical old-timer. As in The County Election, the political realm is exclusively masculine, for the oyster house is a male-only pub. The Workingmen’s Party cartoon illustrates disillusionment with and dissent from the sharply divisive politics of the age. It suggests that the corruption of both the Whigs and the Democrats will lead to the oppression of the poor. For each image, before posing the content-specific questions listed below, we recommend that you have students conduct a general analysis using the following four-step procedure. Visual Inventory: Describe the image, beginning with the largest, most obvious features and proceed toward more particular details. Describe fully, without making evaluations. What do you see? What is the setting? What is the time of day, the season of the year, the region of the country? Associations: Begin to make evaluations and draw conclusions using observations and prior knowledge. How does this image relate to its historical and cultural framework? Does it invite comparison or correlation with historical or literary texts? Do you detect a point of view or a mood conveyed by the image? Does it present any unexplained or difficult aspects? Does it trigger an emotional response in you as a viewer? What associations (historical, literary, cultural, artistic) enrich your viewing of this image? Interpretation: Develop an interpretation of the work which both recognizes its specific features and also places it in a larger historical or thematic context. 1. According to The County Election, who participated in elections? Who was excluded? Nearly all white men participated, but Blacks and women were excluded. 2. How did Bingham explain the enormous popular participation in politics? What drew so many people into politics? The political parties offered drink, food, fellowship, and the opportunity to discuss issues of the day. They distributed pamphlets and broadsides. 3. Why might elections in rural areas have become important social gatherings? They would be a reason for those in rural areas to gather. General farm work took up much of the time, and an election was a reason to take a break from farm work and catch up with the community. The fact that elections occurred on a regular schedule for the most part helped as well. 4. How important were political candidates, issues, and party loyalties? They became important as more people were able to vote. As the parties worked to build their constituency they expected those of their party to be loyal to the party line. 5. How engaged are the voters? They are engaged, including drinking (several have had more than enough to drink), accepting a broadside or sample ballot, and discussing the issues of the election. 6. Who are the men in the top hats? What are they doing? How does Bingham portray them? How do they relate to ordinary voters? The men in the top hats are probably working for a party trying to garner support. They are portrayed as polite strangers who are trying to engage and encourage voters through discussion and distributing pamphlets or sample ballots. 7. What do you think Bingham’s attitude toward elections was? His attitude was that the election was a community gathering for a purpose. There is a suggestion of certified business conveyed by the man at the top of the stairs, so the viewer does not forget that the election is official. But in general the tone is that of a friendly community gathering that welcomes all potential voters. 8. Did he see them as serious exercises of democracy, as farce, or as something in between? He saw them as something in between. There is indeed a serious exercise of democracy as speech appears to be free, but there are also focused attempts at persuasion (coercion?) by those working for the party. 9. What was his attitude toward the electorate? Did he see voters as serious well informed men or as manipulated dupes? He saw voters as well informed, listening to party members and discussing issues with their fellow voters. 10. What does the painting say about elections in a democracy in which common people can cast ballots? Those election results cannot be forecast, as the electorate may change political support even up to the last minute. The activity of the crowd suggests that the electorate was actively engaged and that voter turnout would be large. It also suggests that elections were important events in the growing democracy. 11. How does Woodville draw the viewer into the painting? The man on the left appears to stare directly at the viewer with a bemused expression. This draws the viewer directly into the painting. Also, he shows two men talking, but the one on the right is much more animated. The viewer wonders what he is saying and why the figure on the left does not match the level of animation. 12. What might the open curtain symbolize? It might symbolize that this could have been a private table where the two men could have discussed issued in private. That the curtain is open could symbolize that the issues or discussion expanded beyond the normal limits of conversation. It also could imply that the man on the left is wanting to leave. 13. What sort of people are the men in the painting? What do their clothes tell us? Why has Woodville dressed the young man entirely in one color? What is the significance of their difference in age? The younger man is wearing his top hat indoors, giving the impression of a young, perhaps inexperienced man on the go. By dressing him in one color the viewer focuses more on his apparent harangue than his clothing. The older man on the left appears to be dressed more appropriately, with color, and he conveys experience and possible affluence. 14. What is the man on the right doing? How much does he care about politics? How does Woodville signal his passion? What is the source of his arguments? The man on the right is conveying his passionate argument, and he cares very much about politics. His body language leaning forward conveys his passion. He’s using his hands to convey his message and signal his passion and clings to the newspaper from which his arguments are drawn. 15. How does the man on the left feel about his companion’s political arguments and passion? Do you think he agrees or disagrees? Does he care? The man on the left is a bit apathetic, conveying that he has either heard this before or doesn’t care. His facial expression asks the viewer to save him from this speech. 16. What attitude does Woodville take toward the political passions of the man on the right? Does he think they are good, bad, ridiculous? Compare his attitude toward the politics of his age with that of Bingham. Woodville thinks that much of the political polemics is just so much hot air and that most men will make up their own minds. This contrasts with Bingham’s portrayal of the process of a democracy. 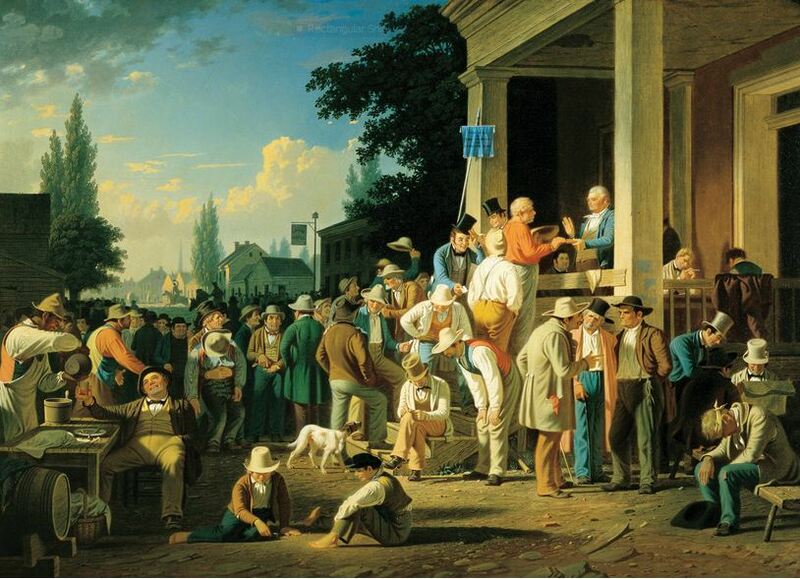 Woodville portrays democracy on a one-to-one scale, while Bingham conveys the expansion of democracy. Liberty’s banner [Candidates of the Agrarian Workingmen’s Party, Nov. 1830 election]: “Register, John R. Soper, Mariner. Assembly, Henry Ireland, Coppersmith; William Forbes, Silversmith; William Odell, Grocer; Micajah Handy, Shipwright; Edmund L. Livingston, Brassfounder; Joseph H. Ray, Printer; Merritt Sands, Cartman; Samuel Parsons, Moroccodresser; Thompson Town, Engineer; Alexander Ming, Senior, Printer; Hugh M’Bride, Cartman. For Lieutenant-governor, Jonas Humbert, Senior, Baker. Senator, George Bruce, Typefounder. Congress, Alden Potter, Machinist; John Tuthill, Jeweller; Thomas Skidmore, Machinist. 17. Compare the party man’s clothes with those of the working man. What do their clothes say about each man? The party man is dressed more formally, while the working man is without a coat and has his sleeves rolled up. The party man is not accustomed to work while the working man is someone that labor could identify with. 18. What is the politician trying to accomplish? He is making a deal with the devil in order to limit and control the working man. 19. What function does the cartoonist think the parties and their newspapers served? The parties and their newspapers kept the working man from achieving the liberties due to him. They kept monarchies, anarchies, and those who would deny working rights in power. They also kept the working man from achieving political power. 20. What was the cartoonist saying about the character of the Workingmen’s Party? The Workingmen’s Party is directly opposed to the main parties and wants to empower the working man to have control over those laws that directly affect them. 21. Which figure — the workingman or the party politician — did the cartoonist think was the legitimate protector of the accomplishments of the Revolution? He felt the workingman was, since he is working with Mother Liberty. 22. What is the cartoonist saying about the nature of politics as conducted by the major parties? The major parties conduct politics in an evil and dishonest way, making deals with the devil. They are corrupt. The party man has a bag of money in his hand, contrasted with the ballot in the hands of the workingman. Thus the major parties get their power from money rather than the voice of the people (or the ballot). 23. What solution does the cartoonist offer to solve the problems of political corruption and working class oppression? He suggests that political power to the workingmen through the vote will solve these problems. Ask your students, either in discussion or in a written assignment, to analyze George Caleb Bingham’s Stump Speaking (oil on canvas, 1853-54) in terms of the changes that occurred in American politics between the 1820s and the 1850s. How does Bingham’s Stump Speaking reflect changes that occurred in American politics between the 1820s and 1850s? Compare and contrast Bingham’s Stump Speaking with Rockwell’s Freedom of Speech. How does the 1943 painting reflect political changes that took place in America a century earlier? George Caleb Bingham, The County Election, oil on canvas, 1852. Saint Louis Art Museum, gift of Bank of America, 44:2001. Reproduced by permission. 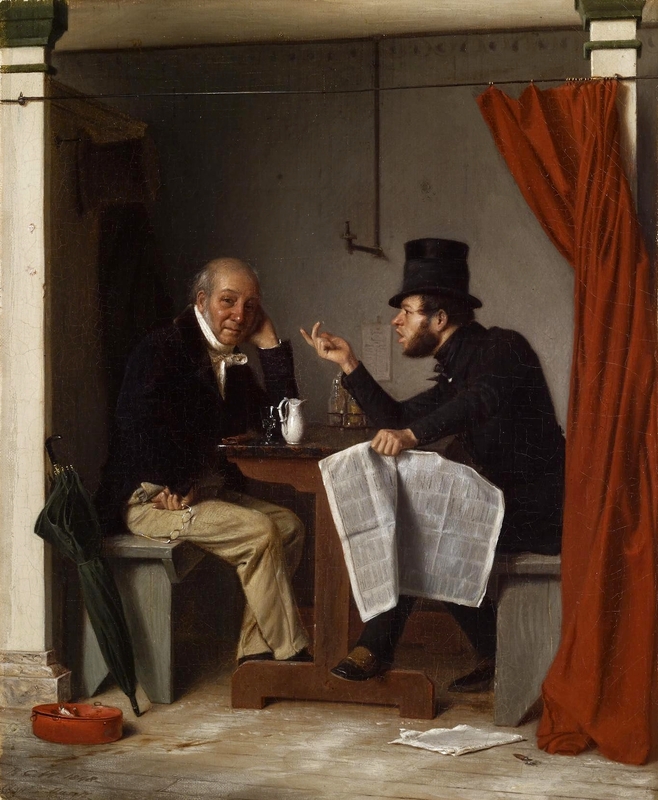 Richard Caton Woodville, Politics in an Oyster House, oil on fabric, 1848. Walters Art Museum, Baltimore, Maryland, 37.1994. Reproduced by permission. Agrarian Workingmen’s Party of New York City, political cartoon, ca. 1830. Columbia University Libraries, Rare Book and Manuscript Library, Edwin Kilroe Ephemera Collection. Reproduced by permission. I've used these three pieces as window's into the Jacksonian era for my 7th grade students. I found the political cartoon to be simply to difficult for them, however the County Election is very accessible to students, and they love discussing the reasons why the artist portrayed the election as it is. I typically use the see/think/wonder protocol with art pieces; I have the students work through their observations, thoughts and questions, and then reveal the source, asking them to draw further conclusions. I love using art in the classroom! This would be a fun lesson to use with my classes. I try to enforce the fact that art work is like a window to the past to see what people really valued. Looking forward to trying it when I get to that unit. The questions are helpful...some of them #8, #12 I probably would not have thought about asking.